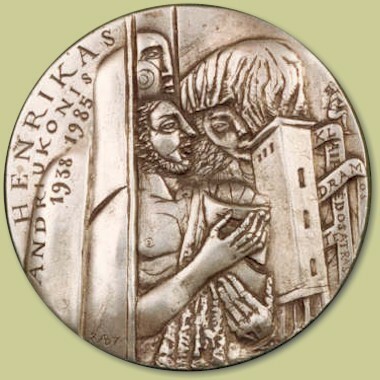 The art medal, and therefore also the art of making medals, is a relatively little known area in the art world. This may be partly due to the fact that these works are mostly well hidden in safes or even in bank vaults and are therefore not on regular view. This method of storage is quite frequently used even for medals that do not have a particularly high value. Maybe, because many pieces cannot be obtained easily and their acquisition is frequently associated with some major effort or with a stroke of luck, this causes the collector to view these works with greater affection. Also, art medals are frequently of a smaller size than paintings, and can therefore appear less presentable. At the same time, the relative lack of respect given to this area of art may be caused by the many, mass produced, coin like objects that are typified by somewhat dreary, unimaginative images. The opportunities of expressing oneself, offered by creating an art medal, a plaquette or a small sculpture, of either cast or struck variety, are little known. This website was created with the aim to try and close this information gap and to stimulate your interest in the art medal. To this end, a few struck or cast medals and plaquettes from a variety of areas, will be shown on this site. (Commercial interest or activities are not connected with this site.) The choice is completely subjective and surely open to attack from an artistic point of view. It is acknowledged that the idea of Art cannot be generally defined. Although many of the works of medallic art shown here are from the period around 1900, in no way should it be thought that this is to be used as an artistic standard. German modern day medallists are virtually absent from the pictures shown below. Because of the necessarily limited choice, it would be easy for the wrong idea to be formed with regard to the modern art medal. If you should want to know more about these, please contact the Deutsche Gesellschaft für Medaillenkunst in Berlin. (see Links). Information about international medallists and their work can be obtained from FIDEM (Federation Internationale de la Medaille, Address: Monnaie de Paris, 11 Quai de Conti, 75270 PARIS). The above mentioned societies regularly stage meetings and exhibitions and publish catalogues. Contact with medallists, with those scientifically engaged and with other collectors, can be established through these meetings. In case you should disagree with the present choice, which I could understand, because of the lack of a representative view of modern works, then please add your own choice to the Web. This would surely help to enrich the appreciation of this subject. If you should be interested to show some of your art medals on the internet, either anonymously or under your own name, with or without your email address, non commercial interests provided, I would be pleased to assist you on this current web site. The art medals should, however, be in harmony with the overall appearance of the website in respect of content and presentation. This offer has already been taken up, for which I would like to thank the relevant collectors. So that no misunderstanding should arise, please note that most of the non-historical and relatively recent art medals that appear below, were acquired for the equivalent value of about one to one and a half tanks full of petrol for a middle-of-the range-car, with a strong downward tendency if the price of petrol keeps on rising as in the recent past. Although they are not of enormous monetary value, they are prized because of the effort and chance it took to acquire them. A collection of art medals, as shown here, has to be considered as unsuitable for investment purposes. This is surely another reason for the lack of popularity of this area to those art collectors who have a lucrative and secure investment in mind.